Learning disabilities are taxing for both the parent-educator and the child, and sometimes discouragement prevails. In the midst of their struggles, some families wonder, as they weigh the pros and cons of homeschooling, if it really works. When a core subject like writing is painfully difficult, doubt is amplified and panic can set in. 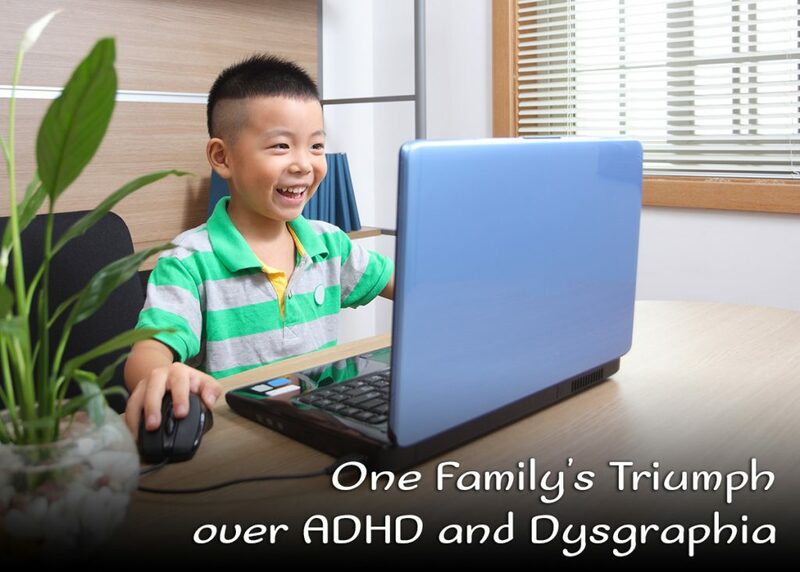 If your child struggles with writing, take heart as you read about this family’s uphill battle with ADHD and a writing disorder while they homeschooled from kindergarten through high school. Susan* recalls how her son, James*, could never sit still, whether for meals or a visit to the dentist. “It was his constant need to squiggle,” she says, “that tipped the scales in favour of choosing homeschooling. I just couldn’t picture him sitting all day in a classroom.” At home, James could take frequent breaks, at first working only 15 minutes at a time, interspersed with playtime or exercise breaks. While Susan found it relatively easy to accommodate her young son’s need to always be in motion, she soon found that writing was a monumental struggle, that impacted every other subject area. He experienced emotional meltdowns during math if Susan insisted he write the steps down on paper. Writing even small amounts became an arduous task. “Lines did not seem to exist…,” his mother recalls. “Small letters were mixed with capitals, and spelling was a nightmare.” And that was just copywork. When James was 10, Susan had to face the fact that her son could not spell even the simplest of words, so she reluctantly began researching learning disabilities, which finally set the pair on a path to success. James underwent an educational assessment with a special education teacher, who made practical suggestions for homeschool curriculum and therapy. Although her suggestions, such as teaching James to type, were invaluable, Susan felt the need to dig deeper to understand her son’s difficulties. Even though they were equipped with practical suggestions, therapies, and curriculum designed for learning disabilities, progress was slow, and at times Susan admits that it often seemed like it was two steps forward and one step backwards. With time and perseverance, James wrote solid sentences, and eventually complete paragraphs. Typing on a computer helped enormously, alleviating some of the challenges of dysgraphia, such as letter formation, spelling, and hand cramps. He also learned to hyper-concentrate to combat his ADHD, accomplishing his work in a short span of time. Since sitting still was so taxing for James, he found he could compensate by using this technique to complete tasks as quickly as possible to help himself remain focused. He later applied this method to everything from assignments to exams. Their perseverance paid off, and although James needed an extra year to complete high school, he finished well; in several subjects, his average was above 80. James began college this fall, in the hospitality industry. He is even taking notes and writing his exams by hand, although he could ask for accommodations if he felt the need. James says the other students tease him about his chicken-scratch handwriting, but he takes it all in stride. After all, he is excelling in the program, at the top of his class and loving every minute. In retrospect, how does this homeschool graduate feel about having been homeschooled? He recently told his mother, “It’s a good thing I was homeschooled because I never could have sat still in class when I was small! In fact, I doubt I would have even finished high school if I hadn’t been homeschooled.” Is there a better acclamation for a homeschool mom?